A new survey taken by members of the Pet Food Manufacturers’ Association has confirmed the reasons why pet food manufacturers value the trade body. 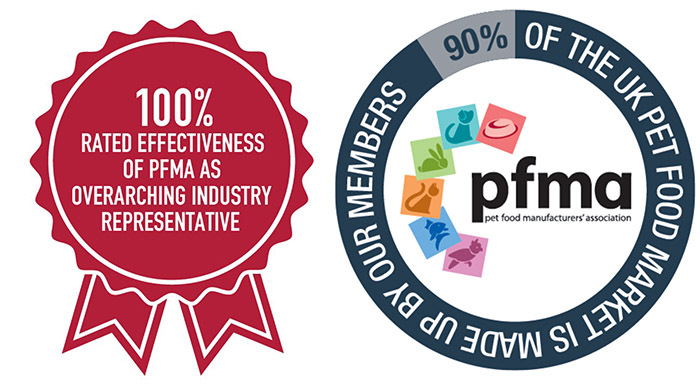 An impressive 100% confirmed the effectiveness of PFMA as overarching industry representative. The most valuable benefits of membership were ranked as:technical support (94%), increased credibility (92%), committees and working groups (85%), lobby influence (83%), networking (81%) and educational material (79%). Nicole Paley, the PFMA’s deputy chief executive, said: “PFMA represents over 90% of the UK pet food industry with 85 companies in membership. Over the last 15 years, PFMA membership has doubled and diversified – we now have dedicated working groups focusing on feed for birds, fish and a group of commercial raw producers.